In a museum it is always good to have items that add atmosphere to a general scene. Of course, at Market Lavington Museum everything has a connection with our parish but even so, some are of a general nature and today we feature one such item – a tin for pins. 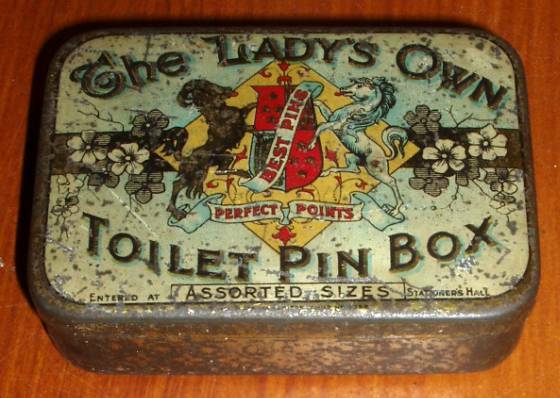 This is The Lady’s Own Toilet Pin Box – clearly the best pins with perfect points. They (we have two such tins) contained a quarter of a pound weight of pins of assorted sizes. Toilet pins have nothing to do with washing or the lavatory. 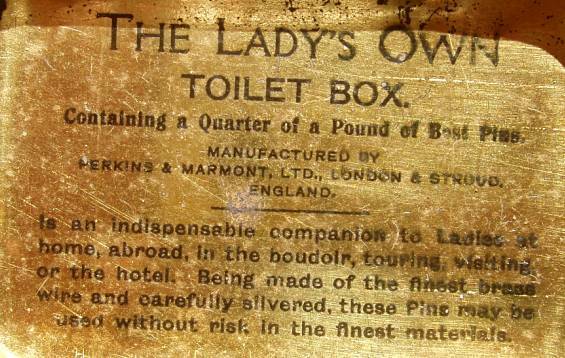 The word ‘toilet’ derives from the French toile, which means material so they were pins for material. The special feature was a large head (originally of glass) and a thinner shaft so that a smaller hole was made in the material. One of our tins has a well kept inside. The tin dates from about 1890 although it could be as recent as the 1920s. These tins appear to have got all round the world, to judge from sales on Internet auction sites. The same sites would suggest very little value, but we are delighted to have two such boxes at Market Lavington Museum. You can find them on the mantelshelf in the kitchen. This entry was posted on July 21, 2010 at 6:18 am and is filed under Museum. You can follow any responses to this entry through the RSS 2.0 feed. You can leave a response, or trackback from your own site. Sorry, I really know nothing about them. Maybe the needle museum (http://www.forgemill.org.uk/) could help. a very nice tin it is.